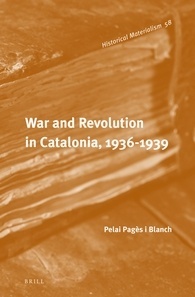 In this monograph Pelai Pagès i Blanch, professor of contemporary history at the University of Barcelona and an authority on the history of the Spanish Civil war, sets out to describe and analyze the origins and the course of the Spanish Civil War, almost entirely focusing on Catalonia. All events and developments of the war are thus described from a Catalonian point of view. Apart from this, the book follows a traditional design, starting with an explanation of the root causes of the war followed by a chronological handling of the war to the fall of Catalonia in 1939. Particular attention has been given by the author to the May Events of 1937 in Barcelona, which he sees as being crucial in the ongoing revolution in Republican territory. After May 1937, the grip of the Moscow-backed Partido Socialista Unificado de Cataluña (PSUC) on Catalonia and of the Partido Comunista de España (PCE) on the Republic as a whole, became stronger and stronger. For some this meant an end to the revolution and the start of counterrevolutionary measures, to others it just represented the long awaited return to order that was so desperately needed in the war against Franco and his troops. Although it seems that Pagès i Blanch stands unsympathetic to the conduct of the communists in the war, he makes it clear that a centralized republican government was indispensable for the Republic in order to win the war. The conviction that with the quelling of the revolution also the war against the military rebels was lost he sets aside as unrealistic. The most interesting parts of the book are formed by the author’s handling of the revolutionary courts of justice that sprang up in Republican areas and his description of the Catalonian building of a war industry. To begin with the first, the first so-called ‘Popular Tribunals’ were set up in the early months after the outbreak of war, in order to make an end to the arbitrary killings of alleged fascists that were happening since. Although the author naturally doesn’t approve of these reprisals, he makes a clear distinction between the systematic policy of violence that was carried out by the rebels, and the uncontrollable spontaneous deeds of revenge that were committed by the masses in the Republican zone. Where the Republican government after the army’s uprising faced the complete breakdown of its bureaucracy and could not keep order, the rebel army chose deliberately to create and maintain an atmosphere of terror and death as a strategy to force conquered territories into submission. At the beginning of 1937 the revolutionary popular tribunals were replaced by the so-called ‘new tribunals’ that were a great deal more influenced by the central government, in line with the gradual increasing hold of the central government on political issues in Catalonia. Eventually these tribunals were replaced by ‘Courts of Espionage and High Treason’. These ‘special’ courts were much feared and were known for their harsh sentences. The development of these courts was entirely in line with the increasing Stalinist influence on the Republican zone, and the many cases of conviction for ‘high treason’ and ‘defaitism’ breathe the spirit of totalitarian communism, for which Stalin’s Soviet Union had become so notorious in the course of the 1930’s. In the chapter concerning the building of a war industry in Catalonia then, the author describes the inventive way the Catalonians turned their peacetime industries into weapon-, munitions-, and tank factories. Most interestingly though, is the stance of the central government to the war industry in Catalonia. According to Pagès i Blanch, the Madrid government stood rather reluctantly towards an important war industry in Catalonia, which was, after all, beyond its immediate reach because of the Catalan regional government, the Generalitat. Rather than supporting the developing weapon industries in Catalonia, the central government chose to persist in trying to buy weaponry abroad. As in many studies of the Spanish Civil War, Pagès i Blanch sees in the behavior of the communists the chief reason of the disintegration of the Republican solidarity. In their lust for power they didn’t stop before they had destroyed the dissident marxist Partido Obredo Unificación Marxista (POUM) after the May Events of 1937. When prime minister Largo Caballero refused to ban the POUM, the communists provoked a government crisis in which he was replaced by Juan Negrín as prime minister. Then, the repression against the POUM started still. As far as the author is concerned the most powerful men of the Republic, Azaña, Negrín and Prieto stood very hostile towards the self-governance of Catalonia. They were of the opinion that Catalonia contributed not enough to the war effort and acted too much on its own, with negative consequences for the war against Franco. The animosity between the government of the Republic and the Generalitat was that high that some Catalan nationalists state that Catalonia was not first occupied by Franco’s troops but by Negrín’s government. The book deals concisive with the final Ebro offensive and the rapid collapse of the Republican front and defence of Catalonia afterwards and the subsequent end of the war. In the conclusion a committed Pagès i Blanch explains to what great extent the authoritarian occupation by Franco has restrained Catalonia’s growth in every respect, be it cultural, political or economic. The consequences of which are even today still noticeable, he states. Although it can’t be denied that the author clearly wrote this book from a perspective to a large extent sympathetic to Catalan separatist tendencies, he succeeded in writing a vivid and revealing book about the conception and experience of the civil war in Catalonia. Centralist attempts by the Republican government are maybe sometimes too easily brushed aside by Pagès i Blanch as attempts to strangle Catalan self-government, at times when the reality of definitive defeat in battle and in the war grew larger and larger and the Republic needed all the resources it could lay hands on, and in a most profitable way as possible. The counterproductive actions of the communist parties can however be seen as fatal in undermining the fighting spirit of Catalonia’s most popular militias of anarchists and to a lesser extent, Marxists, turning the struggle into a civil war within a civil war. Altogether Pagès i Blanch’s book will be appreciated by scholars and students of the Spanish Civil War alike, especially those with a special interest in the Catalan experience.